Our son is just learning to walk, which means crawling is still his preferred method of transportation. Alaska summers can be wet and although yesterday was a balmy 66 degrees and every child on our street was playing out in the sprinkler, most of the time it's a bit chillier. Jack has been recently introduced to the outdoors that isn't covered in snow. 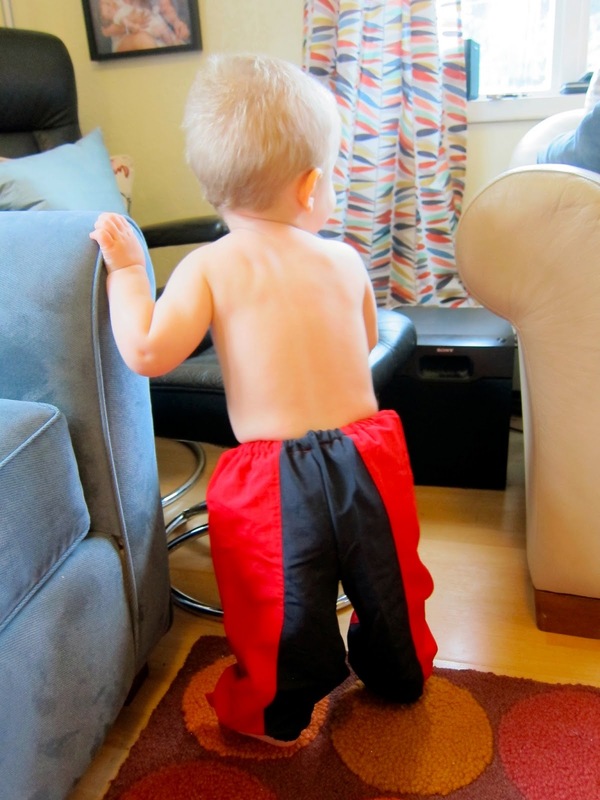 It's too warm for a snow suit and he keeps mucking up his regular pants. What I really needed for him was a pair of outdoor pants. 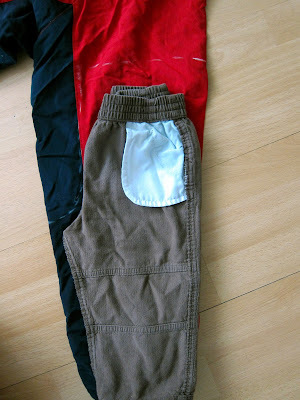 I'd long ago posted about making pants from t-shirts and I've also made baby pants from sweater sleeves. 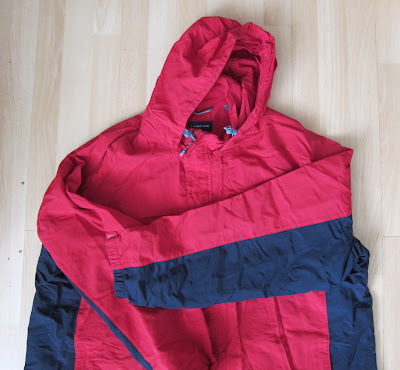 Wouldn't it be perfect to cut up an old rain jacket and make pants out of it? Usually rain jackets have adjustable wrist straps, which would totally work to tighten over baby boots. Yes, it can be done! And thanks to a church rummage sale yesterday, I did it for less than a dollar. This project is super simple. You literally only sew two seams and then sew up the elastic. It took me 20 minutes from start to finish. 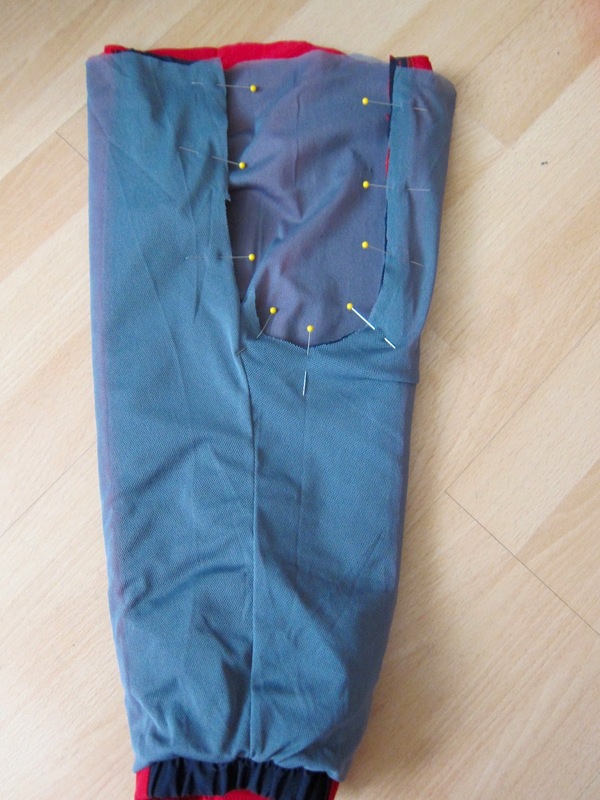 You'll be using an existing pair of pants as a pattern. Turn them inside out. Take one leg and turn it right side out. Tuck it inside the other leg so it looks like you have a one-legged pair of pants. Fold the pants so the inseam is along the edge. Ta-da! 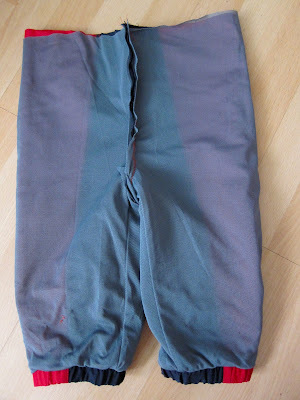 Pants pattern. Study how this looks because you'll be doing this later. 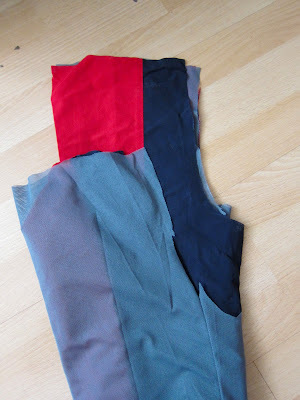 Lay your pattern on top of one of the jacket sleeves so the hem of the pant leg is the end of the sleeve. Using chalk, mark the rise and waistband of your pants, about an inch away from the pattern on the rise and three inches above the waistband. This isn't an exact science, but you want enough room in the waistband area so you can fold it down twice and still be able to fit a diaper. Cut your sleeve along your markings. My jacket had a breathable liner, which I decided to keep 'cause it worked out that way. 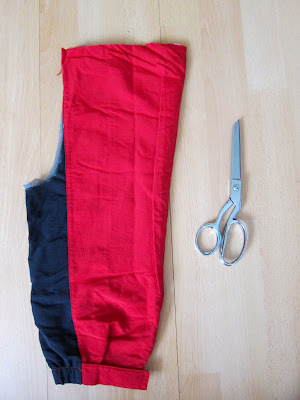 Lay the leg you just cut on top of the other sleeve and follow along those cut lines for the second leg. You are now halfway done with your project. Turn one leg inside out. 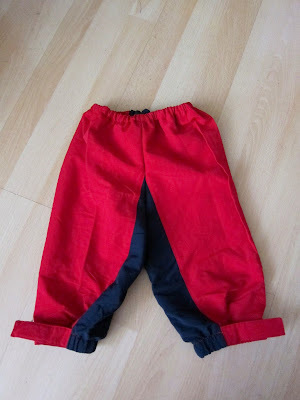 As you did with your "pattern," tuck the right-side-out pant leg inside the leg you turned inside out. Line up the cut edges along the rise and pin in place. Sew this one seam. I double stitched it in case Jack is rough on them. Un-tuck the legs and you should have an inside-out pair of pants with no waistband. Fold down the waist about 3/4 inch and fold it down again so there are no raw edges. Pin all around the waist. 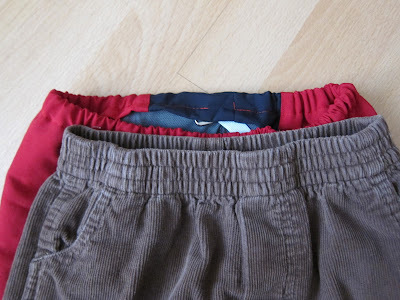 Turn the pants right side out and sew around the waistband, making sure there is just over a half-inch space to run the elastic through. Leave a small part unsewn so you can run the elastic through. 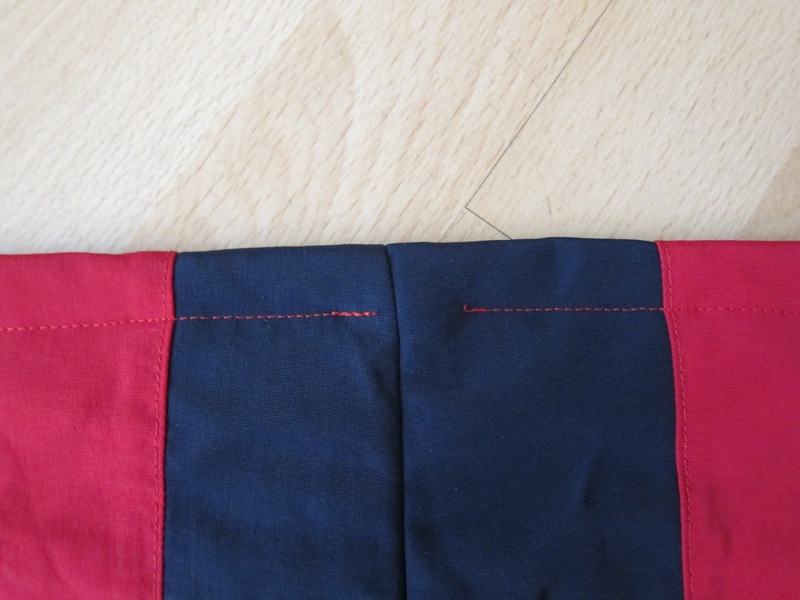 You could do this with the pants inside out, but I like knowing what the outside seam looks like cause I sew totally crooked. 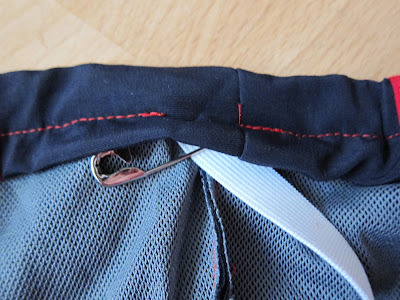 Put a safety pin through the end of the elastic and run it through the waistband. Use the pattern pants as a guide for how tight to make the elastic, or use your child as a model. Mine was sleeping so I winged it. When you've decided how tight the elastic should be, sew both ends of the elastic together with a zig-zag stitch back and forth a few times. 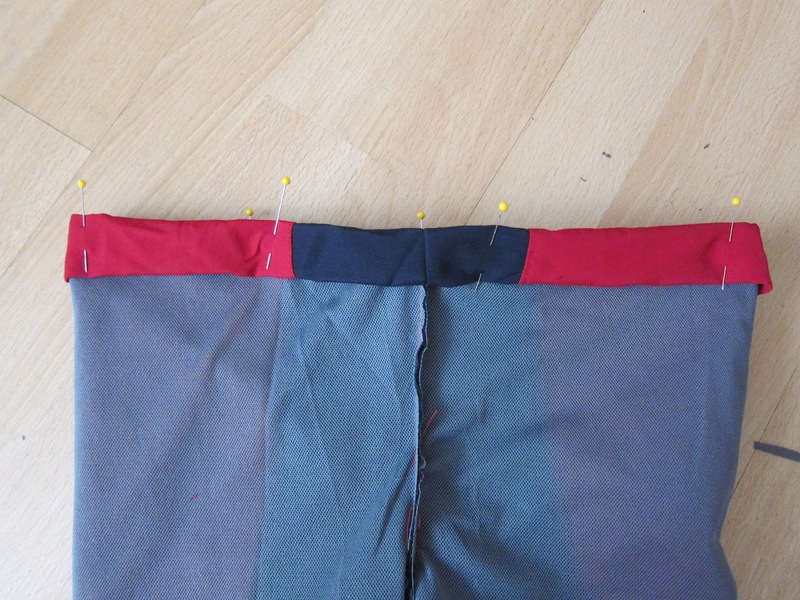 Sew over the opening in the waistband. Put pants on your baby and let him get dirty out there!